The Gospel of the Witches begins with the tale of Aradia's birth to Diana and Lucifer. In the beginning before all creation was Diana, within Her were all things. She divided Herself into darkness and light. Lucifer her brother and son, herself and Her other half, was the light. When Diana saw Lucifer and the beauty of His light she yearned to possess it. She wanted to receive the light into Her darkness and trembled with desire. This desire was the Dawn. Lucifer fled from Diana and would not yield to Her wishes. It happens that Lucifer had a cat that He loved above all creatures and it slept in His bed every night. Diana persuaded the cat to change forms with Her, and She lay with Lucifer on the bed. In the darkness Diana changed back into Herself and so by Lucifer became pregnant with Aradia. Diana descended to Earth disguised as a mortal where Her knowledge and passion for witchcraft made Her so powerful that She became the Queen of the Witches. She became so well known that She was forced to shed Her human disguise and return to heaven. The Queen of the Witches had a duty to continue to teach witchcraft on earth so She delegated this task to Her daughter Aradia. Diana instructed Aradia to "go to earth below / To be a teacher unto women and men / Who fain would study witchcraft". Aradia would be the first of the known witches in the entire world. Diana instructed Her in the arts of poisoning, binding and paralyzing so that She would be able to defend and protect Her followers from the tyranny and oppression of the Church. When Aradia descended to earth, she became the first of all witches, and promised her students that "ye shall all be freed from slavery, / And so ye shall be free in everything". Aradia was a Goddess who didn't have any qualms at all about exacting retribution upon those who harmed her followers. Aradia is both the daughter of, and messenger of, Diana in Her aspect as Great Mother. The legend of Aradia may have originated in a dim memory of an actual woman who was a great teacher of magick and witchcraft and who was a defender of the poor. Like King Arthur or Jesus of Nasareth the myth figure can also become the deity. The God/dess form evolves and acquires its own independent validity and power. Aradia has become an important figure in Wicca as well as some other forms of Neo-Paganism. Some Wiccan traditions use the name "Aradia" as one of the names of the Great Goddess, Moon Goddess or "Queen of the Witches". Portions of Leland's text influenced the Gardnerian Book of Shadows, especially the Charge of the Goddess. Between 1950 and 1960, "Aradia" was probably the secret name of the Goddess in Gardnerian Craft. The Goddess Aradia is a central figure in Stregheria, an "ethnic Italian" form of Wicca introduced by Raven Grimassi in the 1980s. 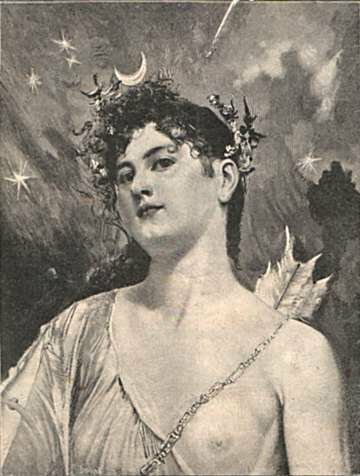 The Goddess form of Aradia today is that of a nature Goddess, crowned with the crescent Moon of Her mother/other self-Diana. She is young and beautiful, but wise. Her consorts are Cernunnos, Herne or Pan. The phrase 'stand I naked' does not mean 'without clothes'. It actually refers to being vulnerable and in need of the assistance of the Triple Moon Goddess.